Despite the name, General Surgery is anything but general. In fact it is a surgical specialty that involves work on many different body systems. General surgeons not only perform surgeries for a wide range of common ailments, but are also responsible for patient care before, during, and after surgery. General Surgeons are trained to operate on the Alimentary Tract (esophagus and related organs), the Abdomen and its contents; as well as Breast, Skin and Soft Tissue and the Endocrine System. Which means they operate on the vast majority of the body. As a result of the numerous ailments they treat and surgeries they perform, coding for general surgery can be a difficult proposition. In this session we are going to put your mind at ease by taking you through some of the most common procedures performed by general surgeons so you can be a cut above the rest. Utilize learned information to make logical decisions regarding coding for general surgery procedures in CPT. 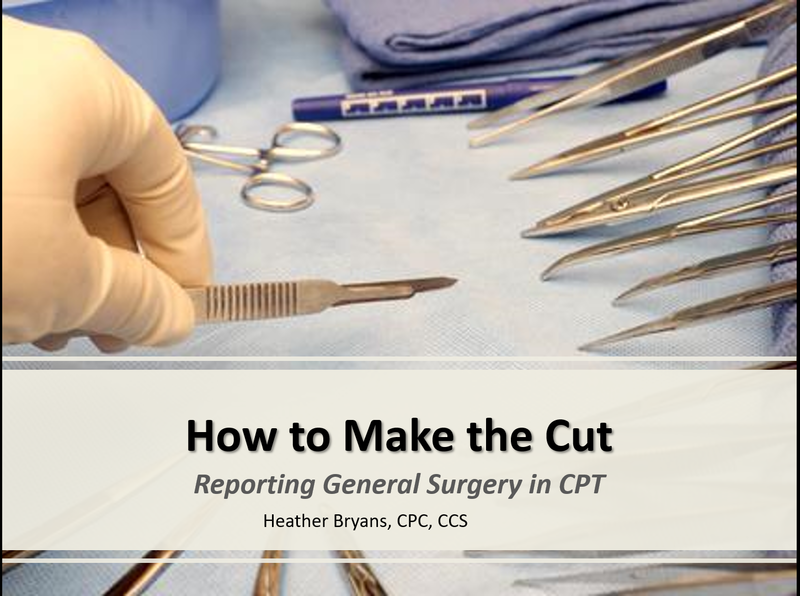 Describe key regulatory guidance specific to coding for surgical procedures and apply this knowledge in your own provider’s claims.